Urothelial papilloma of the bladder. The lesion is composed of a delicate fibrovascular core covered by normal-appearing urothelium. TNM stage Ta applies (noninvasive). Urothelial papilloma does not spread. Montironi R, Lopez-Beltran A, Scarpelli M, Mazzucchelli R, Cheng L. Morphological classification and definition of benign, preneoplastic and non-invasive neoplastic lesions of the urinary bladder. Histopathology. 2008 Dec. 53(6):621-33. [Medline]. Epstein JI, Amin MB, Reuter VR, Mostofi FK. The World Health Organization/International Society of Urological Pathology consensus classification of urothelial (transitional cell) neoplasms of the urinary bladder. Bladder Consensus Conference Committee. Am J Surg Pathol. 1998 Dec. 22(12):1435-48. [Medline]. van Rhijn BW, Montironi R, Zwarthoff EC, Jobsis AC, van der Kwast TH. Frequent FGFR3 mutations in urothelial papilloma. J Pathol. 2002 Oct. 198(2):245-51. [Medline]. McKenney JK, Amin MB, Young RH. 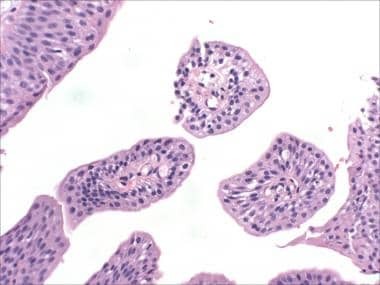 Urothelial (transitional cell) papilloma of the urinary bladder: a clinicopathologic study of 26 cases. Mod Pathol. 2003 Jul. 16(7):623-9. [Medline]. Harnden P, Mahmood N, Southgate J. Expression of cytokeratin 20 redefines urothelial papillomas of the bladder. Lancet. 1999 Mar 20. 353(9157):974-7. [Medline]. Williamson SR, Wang M, Montironi R, Eble JN, Lopez-Beltran A, Zhang S, et al. Molecular characteristics of urothelial neoplasms in children and young adults: a subset of tumors from young patients harbors chromosomal abnormalities but not FGFR3 or TP53 gene mutations. Mod Pathol. 2014 Nov. 27 (11):1540-8. [Medline].